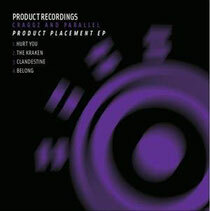 Craggz & Parallel return with some new material in the form of the ‘Product Placement EP’, their first major release since the ‘Turn The Page’ LP. Kicking off proceedings is the gritty tech stylings of ‘Hurt You’. The creeping intro, all filtered ‘80s synths, horns and a lilting looping female vocal lure you in one direction before a classic break turns it into a dark and moody stepper which should appeal to those who like their sounds slightly more edgy and raw. Up next is ‘The Kraken’. Gnarling synths, tight percussive drum work and a heavyweight bassline all combine to bring ‘The Kraken’ together for some naughty unadulterated funk ‘n’ bass and house piano lines. Switching up the style once more, things get a little more stripped back and minimal on ‘Clandestine’. With super- low, chest rattling sub-bass mixed with dark atmospherics and haunting pads, the percussive elements keeps the pace moving along. Rounding off the EP is ‘Belong’, showcasing the production duo’s versatility it starts life as a dubby, bleeped out skanker until suddenly, the tempo switches and turns it into a dangerous 130BPM beast. Out on Monday, check the video below.